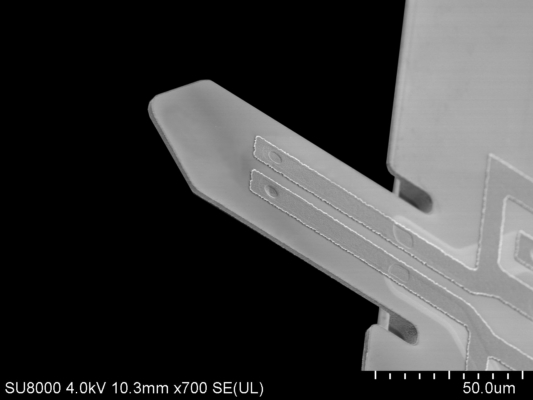 This is a special type of SCL’s self-sensing cantilevers without a tip (tipless, TL). This cantilever type is especially suited for gas property measurements, force sensing, torque magnetometry and further applications. The free place at the free cantilever end can be used to deposit an own tip, attach a sample, etc. By standard this cantilever is delivered bonded onto our cantilever PCB (CL-PCB) with a small 10 pin connector on its lower side. But you can also order the bare silicon chip without a PCB and connector for bonding on your own PCB holder. We offer this cantilever type with or without an integrated heater. PRSA (Piezo-Resistive Sensing & Active) cantilever probes exhibit a Wheatstone bridge and a thermal actuator (heater structure). PRS (Piezo-Resistive Sensing) cantilever probes exhibit the sensing Wheatstone bridge (without a thermal actuator). 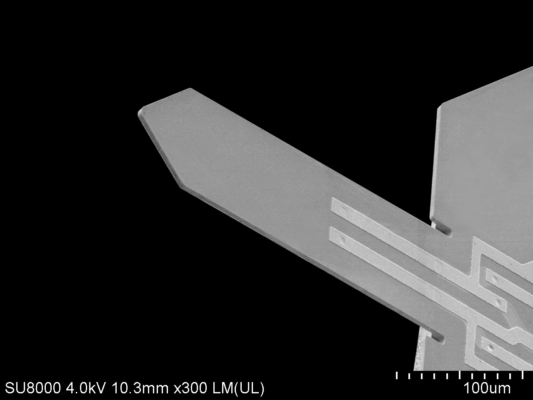 Piezo-resistive self-sensing 300x100 µm cantilever probe without a tip (tipless) bonded to a small PCB with a connector or non-bonded as silicon chip. 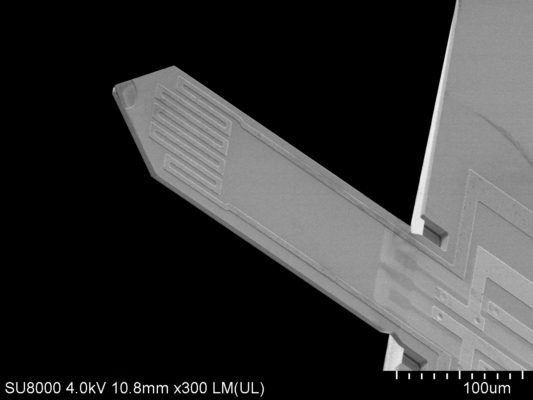 Piezo-resistive self-sensing 450x100 µm cantilever probe without a tip (tipless) bonded to a small PCB with a connector or non-bonded as silicon chip. 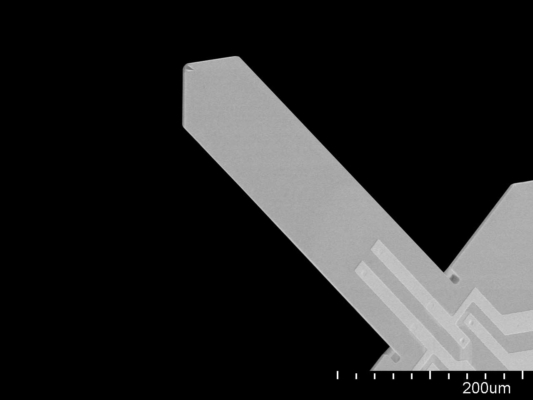 Piezo-resistive self-sensing 100x48 µm cantilever probe without a tip (tipless) bonded to a small PCB with a connector or non-bonded as silicon chip.